In order to print full color photographic images, most printing presses use the same basic four ink colors. These four colors are placed on paper in layers of dots that when combined they create the illusion of “full color”. The term CMYK refers to the same four ink colors, C being cyan, a blue-green color: M stands for magenta, Y for yellow and K stands for black ink. To explain further, in this typical four-color process printing, a color image is separated into four different color values by using filters and screens. This is called color separation. Initially the color separation used to be done using photographic film like you have in cameras but now it is all done digitally. After the color separation, the file is transferred to four plates and printed on the printing press with the four inks- Cyan, Magenta, Yellow and blacK. Thus the entire spectrum of colors is effectively reproduced using just the four-color process. The CMYK four color process printing is generally used by graphic designers and in the commercial printing industry for purposes of reproduction of color images and text. Almost anything you see published as newspapers and magazines, business cards, flyers and brochures as well posters, are all printed in CMYK. Studies conducted reveal that use of color in magazines and other publications help to increase readership by more than forty percent. In fact, there is a sixty five percent increase in retention of material when full color is used instead of the traditional black and white. CMYK is typically known as a subtractive color model. The typical CMYK model works by either partially or fully masking colors in a lighter, but usually white background. The ink effectively reduces the light that would normally be reflected. Hence this model is called subtractive since the ink subtracts brightness from the white. The CMYK four color process printing is sometimes utilized in combination with spot color printing (Pantone colors). 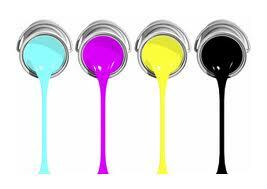 At some printing presses, both the four color process inks and spot color inks are used at the same time. The CMYK four colors process printing is widely used for printing magazines, brochures, business cards, flyers, and in printing pamphlets, post cards, loyalty cards, fridge magnets and stickers. The four color process is also used in printing posters, catalogs and also in book publishing. Four colors process printing used to be slightly more expensive than spot color printing however, today that is no longer the case at OtherDesigns. The color accuracy is dependent to a large extent on the skill and professionalism of the printing press and the print processor. The colors used by the four-color process printing are not solid colors; rather they are a series of dots. They are very much noticeable in the photographs reproduced in the local newspapers. The four color process printing uses both vector based and pixel based images.